Ideal for mild to moderate ACL, MCL and LCL instabilities. For mild to moderate ligament strains, Playmaker II provides the stability needed and comfort required when participating in daily activities. Still not sure? Try our Brace Advisor for personalized product recommendations to meet your needs! The straps are positioned to enhance the support of the ACL. Learn how Four-Points-of-Leverage works. I had my patella removed 15 yes ago, my knee is unstable due to oschgood schlotters disease and EdS I also have CRPS, but need something to give me stability. My leg is weak, I have a hard time going up stairs, I'm constantly banging where my patella should be on things and I am in immense pain. My leg also tends to give out when I am walking causing me to fall. I have arthritis as well. If I get a prescription will my Medicare pay for it? Standing measurements are calf 15, knee 17, thigh 21. So I am both M & L depend on which measurement prevails. Which do I get? I had a meniscus repair and have arthritis in my knee but am outside a lot and play a lot of platform tennis in the winter. This brace in the wraparound sounded like a good fit for my needs. As your knee is on the higher side of a Large that is the size you will want to go with. Getting a wrap around will also allow you to get the brace a little tighter in teh thigh and calf compared to a sleeve and then you will be able to use the straps to help anchor the brace down and in place. Back in January I suffered a complete PCL tear playing hockey but had no other damage to the knee. I didn't have surgery and did a lot of PT and have perfect strength in the knee but, of course, it still moves with the anterior drawer test. I am now getting into boxing and I am wondering if I can do more combat sports with a brace. Are there any braces without exposed hard parts that can be used in grappling sports that will provide enough support for my knee? I've had ACL reconstruction and have no problems with that but on the same knee I now have meniscus tear and degeneration. Is this a good brace for me? Yes, with medial and lateral hinge support and the unique strapping sequence the DonJoy Playmaker II Knee Brace will help prevent injury and provide support. I have torn my ACL and meniscus twice in the right knee, I have gotten surgery twice and gone through some physical therapy. I have taken a break from soccer for about two years now and I would really like to play this year, is this the brace for me? You may want to consider the DonJoy Playmaker with Fourcepoint Hinge, https://www.betterbraces.com/donjoy-playmaker-ii-Fourcepoint, which offers more support for a previous ACL injury. The Fourcepoint hinge trains your knee to stay out of the "at risk" position for the ACL preventing a more serious injury to the knee. Like the playmaker II . Sizing issue? Calf 13-14 "; Thigh 20-21"; Knee Center 19-20. What size do I order as my measurements cove small , XL and L..?? I had a major acl tear and small rupture in meniscus, I got my acl reconstructed about 9 months ago but I still deal with some instability as I am obese. Would this be a good brace for me? I would not be playing any sports I need a brace to support my knee for just some weight training and moderate running. i was wondering if this brace will be strong enough to protect my knee during my senior year football season. I had a major acl tear and I lost a meniscus, I got surgery about 9 months ago but I still deal with pain after practice. Would this be a good brace for me? The Playmaker will provide moderate support to the ACL during football. You can also look at the DonJoy Armor Knee Brace which will provide you with more protection. For running I would recommend the Spacer material since it will be more breathable and lighter weight. I have this brace. Can it washed. It smell sweaty after many uses. I have a torn mcl and menicius. Yes, to clean you can hand wash in cool water, with mild detergent. Rinse well, then lay flat to air dry. Do not put in the dryer. The DonJoy Reaction Web Knee Brace, https://www.betterbraces.com/donjoy-reaction-knee-brace, may be a better option for patella tendon issues and is a light brace for running. It will help align your knee and absorb the shock. I have a grade two ACL sprain and my ACL is partially torn is this a good brace to use daily on my knee ? Yes the Playmaker II is a great brace for someone who has a partial tear of the ACL. The brace will stabilize the knee while doing normal daily activities. I've got a Defiance for my severely ACL deficient left knee but have a much milder instability on the right, just hyper extension and mild pain, but I'd like to add a bit more stability. In general, is there enough clearance between the medial hinges on each brace to prevent them from catching on each other during running? While it does depend on the shape of your knees, but generally the Defiance III knee brace should be able to be worn with another brace on the opposite leg. I was just diagnosed with damaged patella cartilage and an ACL sprain. I am trying to decide between the Playmaker II and the Reaction Web Knee Braces. I plan on using the brace for everyday use during recovery, as well as ideally getting back into running. Which of these would you recommend? Thanks! The Playmaker II would be the better choice as it will offer more support for the ACL. You have an option of getting a patellar donut to support the kneecap. i have a grade 1 mcl sprain and dont know what brace would be good, any suggestions. I have a partial ACL tear that occurred about 6 months ago while playing basketball. I have been to physical therapy and have regained full motion with little to no pain. It is also very rare that I feel my knee give or buckle. My doctor recently recommend the Playmaker II knee brace for me. Would this knee brace give me sufficient comfort and support to continue playing basketball? I do not play competitively just on occasion with friends. I recently severely sprained my MCL competitive dancing. The doctor said I need a good brace with hinges but the ones you get from Walmart just aren't doing much for me. Should I get this brace or would you recommend something else. The Playmaker II will offer great support for the knee. It is low profile and the spacer material is cooler than neoprene. This brace will offer both medial and lateral support of the knee. I have a few questions : if my quad is measured as a smidge over 19 and my calf is 13 would a medium be appropriate? If I have instability with an LCL and Meniscus injury would I need a patella donut? 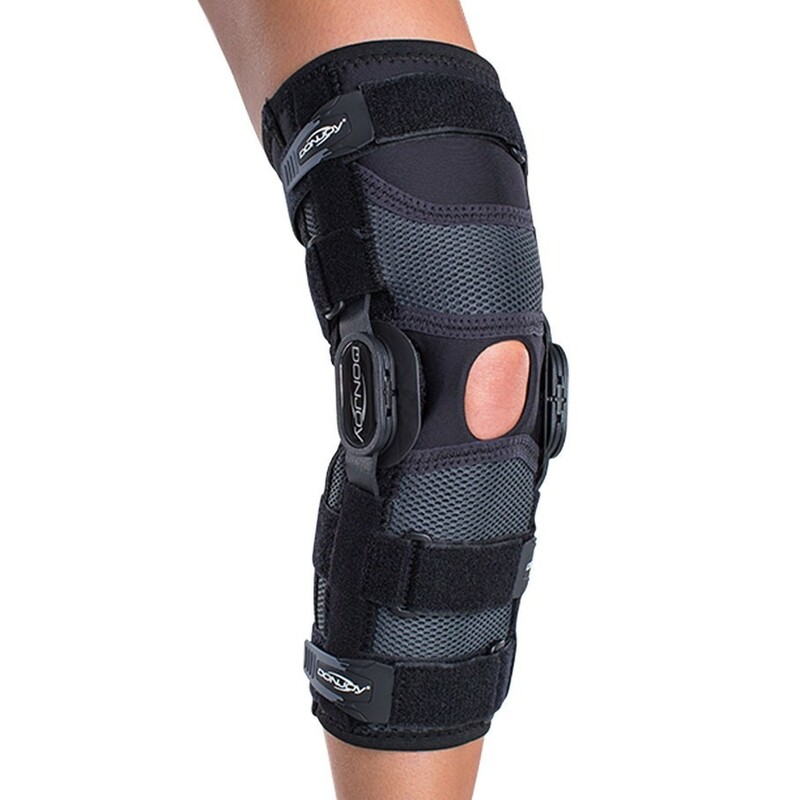 And is this a good brace for everyday use while the knee heals as well as a good brace for sports? Thank you!! I recently, while playing softball, stepped off the base wrong and my knee hyperextended. I have damaged the LCL and Meniscus. My joints are very hypermobile and I have issues with this a lot. For being a very active person, I play softball competitively and I also train gymnastics tumbling, would this be a suitable brace for my lifestyle? I had a complete rupture of my ACL by playing basketball two years ago. I used to go running a lot along with playing basketball and soccer few times a month. Now I am awaiting for a knee reconstruction surgery but in the meantime I would like to get fit and start playing sports again. Would the Playmaker II be useful for running and playing team sports? Racquetball and backpacking are my sports and a torn meniscus is my injury. The Playmaker II looks like a good option. Which version/material migrates the least? I probably don't need it, but is there any downside to getting the donut? Thank you!! Wow! So many questions and so little time. I scanned them all and did not find any that addressed my subject: I just received my brace today. I will be using it for a MCL injury from skiing. It cam with a book and a bunch of little metal pieces. I THINK I figured out where they go, but the book is not terribly helpful. What are these metal things FOR? Do I need them? Does the Playmaker II and Playmaker II with Forcepoint hinge offer the same ligament protection or is one better than the other. They appear to be the same except for the forcepoint hinge. If they offer the same ligament protection plus the forcepoint offers ACL protection than I think its a no brainer for me on which one to purchase. Thanks. My measurements are K: 17 C:15.5 T: 21.5. I bought a large, sleeve, with Patella donut, and spacer material. It starts sliding down just walking with it. Should I go smaller to a M or is there something else I can wear it with. I have a medium playmaker II knee brace (sleeve) w/ donut, Im having issue with brace migration (slipping down) during sport activities. My measurements are Thigh 19 1/2 * Knee 15 * Calf 14. Should I exchange for a small, will this help. Unfortunatly a small brace would be very tight on the thigh. You could try it but I fear it will not fit over your thigh. Ruptured my right ACL for the 4th time (previously had 3 reconstructions but am now choosing to hold off on a 4th). What is the best brace for both light contact sports (such as light recreational basketball) and for everyday activities? Instability is a mild issue and gives out infrequently. I would suggest either a custom brace such as the A22 or the Fullforce ligament knee brace. Both will provide you with maximum protection of the knee and help to keep the knee out of the "at risk" position to prevent further injury. I will be wearing the brace for sports like soccer, basketball, volleyball and softball. I would get the sleeve style but I am not sure whether I should go with the neoprene or the spacer material. What are some of the differences between the two materials? Will I be able to wear with ski boots? Hey. I train strongman daily and also snowboard as much as possible. I currently have a decent chunk of issues with my right knee(scar tissue / tendinitis/ etc) most recently a slight tear in the lateral meniscus. Doctor gave me a shot of cortisol and told me to do some PT before my next snowboarding trip(4weeks out). I am looking for a brace(instead of the regular knee sleeve and kinseo tape I use now) to put on my knee during my next snowboarding trip(maybe something that will help in the gym also). Is this brace the one I am after? Is the Playmaker II without the donut opening, only made in neoprene or do you not carry the the spacer fabric for this option. It doesn't allow me to order the spacer fabric except with the donut butress. Looking at the Playmaker II - I have measured my leg T: 17" K: 14" C: 14"
that fits the small - I am hoping that I will be able to build up more muscle in the leg with the added support of the brace - should i get the next size up? I have already out grown the Donjoy that was made for my leg after my surgery and dont want to out grow another one...but dont want the slipping either.. any input would be great! Thank you! Injury was 3 months ago, without a MRI diagnosed with a "Bad Grade One" sprain. It fine moving linear but still feels unstable moving laterally and there is pain if twisted at all. Im looking for a brace that is low profile but still gives me some good support and allows me to train safely. The Playmaker II would be a good choice but it you would like something a little shorter and something so the hinge isn't exposed take a look at the economy hinged knee brace. It will off the lateral support you need. I had a grade 3 ACL tear 2 years ago while playing soccer and haven't been able to get back to full fitness since. I want to play soccer at an amateur level, would the donjoy playmaker 2 knee brace be suited for what I want to do? I'm concerned that maybe I should be taking a stronger knee brace maybe. Thanks! You might want to go with a more supportive brace such as the Full Force Ligament knee brace. This brace will offer protection of the ACL and help to prevent re-tear shile you play soccer. I'm a bit overwhelmed by the various braces. Would love recommendations on what brace would be most appropriate for these sports: cycling, tennis, running, weightlifting & snowboarding. I tend to do all of these activities and sprained my MCL last month. I sometimes feel pain when I do yoga or bend it in a certain position so I am scared about reinjuring my MCL when I go snowboarding in a week or two. You will want a hinged knee brace to support the MCL. You can go with the Economy Hinged Knee brace or the Deluxed hinged Knee brace. Ok I already have this brace and it's fairly nice and comfortable but when I'm playing football or jus running and bending my leg in general it slips down but not enough to put my knee at to much risk but enough to be uncomfortable. I just want to know if there's a way to make it not slip down as easy. I have a partially torn meniscus and bad arthritis (34 years old and Orthopedic doctor says my knees are equivalent to a 60 year old) and I was wondering if the Playmaker II Brace will give me the support I need for Basketball. I have been through a lot of different braces and I also have 3 Custom Don Joy braces that I use sometimes but they don't seem to give me the support I need while playing Basketball. I'm am trying to choose a brace and I think I have narrowed it down to the Playmaker II (although I just came across the Playmaker II with fource point so a bit unsure). My main sports are snowboarding, karate and from time to time some ultimate frisbee. My days of volleyball and basketball are all but long gone and I still kick around the soccer ball with the kids. When I was around 25 I had my ACL repaired. Since that time it his served me well. Most recently I had a complete meniscus tear on the same knee during a karate session while wearing my old TruFit neoprene brace with metal stabilizers. I would wear it mostly to keep everything tight on days where I was feeling my knee was a bit weak or was experiencing discomfort. I recently had my knee scoped to clean it up because there wasn't much else that could be done being a complete tear. All this being said, I have a DonJoy Defiance brace that was made for me when I had my ACL reconstruction but it's not ideal to where while doing karate as I am afraid someone will hurt themselves on my brace while blocking kicks and as well it's consistently sliding down my leg during the two hours. I have similar issues with it for snowboarding as it comes down to low and interferes with my boot. Being that the Playmaker is a soft brace I was thinking this would solve both of these issues. What would be your recommendation between these two based on my prior injuries? I have also been debating between the wrap around and sleeve as well as the neoprene vs. spacer. The wrap around is ideal for when I am snowboarding as I can wrap it around my polar 'leggings' but I want the most protection and I am not sure this would be the best option as far as compression is concerned. Any advice would be greatly appreciated. I am less worried about my ACL than I am the comfort with my meniscus tear although once in a while I get that feeling that my knee wants to hyper-extend so I try to be careful and make sure my muscles are properly stretched when I get that feeling. I had a skiing injury 1 yr ago with a tibial plateau fracture and a partial meniscus tear that were both repaired with surgery. I want to ski again and provide protection and support to my knee to prevent further injuries (blue-black skier). Is the playmaker 2 a good choice or is there another brace that is better? Also, will the brace come down to interfere with my ski boot? I have medial pain in my knee and it has been aggravated with my golfing. I bought a wrap around Playmaker II with spacer since I live in SoCal but it isn't very comfortable. I wanted the flexibility of on and off but it feels like it is falling down. Should I get the sleeve type or is there an under wrap that will make it feel more comfortable? The wrap around version can sometimes slide down, so changing to a sleeve might alleviate the problem. Looking for a brace to wear everyday. I have a torn meniscus and ACL. I'm 43 and not doing anything to active. I'm a bit overwhelmed looking through all the braces. can you talk to be briefly on the SE-4 (CI), Bionic, and Playmaker II. thanks! The Bionic Knee is going to offer general support to the knee with no support for the ACL. The Playmaker II knee Brace will offer you more support to all of the ligaments of the knee and offer mild support to the ACL. If you are not going to be doing anything very strenuous this brace would be ideal for everyday activities and protection of the ACL. The SE-4 Knee Brace will offer the most support for the ACL. This brace I would suggest if you were going to be doing any athletic activities. Hi. I have a partial acl tear and I'll be using this during my marathon training. I was wondering a) if the sleeve fits under pants or running leggings and b) if you recommend the patellar donut or not for partial acl tears. Thanks! I haven't had any injuries with my knee yet but i'm feeling pain when i'm playing sports (football). Is this a good brace to use for preventing injuries and for stability? I have had 4 knee surgeries on my right knee...3 ACLs and one meniscus. I think I reinjured my meniscus but don't want to go back in for an MRI or surgery. I am an avid runner and cyclist and do fine with those. But I'm also an avid skier and that is where I'm feeling the tweak in the meniscus area of my knee. Would this brace offer good support for my situation? Thank you. The Playmaker II can be used while skiing. The brace will support both the meniscus and the ACL. I have a partially torn acl with a little instability, with a some patella instability. Can this brace help with the patella instability? I'm 67 years old and had meniscus surgery 50 years ago. I suffer from ligament instability and whenever I try playing recreational tennis my knee swells up rather quickly. I have no chronic pain and have no problems with normal activities like long walks or bike rides. Would the Playmaker II be an appropriate choice for me for playing tennis or would another brace me more appropriate? The Playmaker II would be a good brace to provide you with support to the knee joint while playing any sports. The brace has bilateral hinges for medial lateral support and has our "four points of leverage" strapping system to help support the ACL and PCl. I am 34 and I have been having knee pain my whole life!! I was born with bilateral congenital hip dysplasia and it was NOT fixed correctly when I was a baby. So my knees are twisted in, almost like I am knock kneed. I have had 3 arthroscopic surgeries on my right knee. 2 were lateral releases with 1 also having a complete lateral meniscus tear, and 1 scar tissue removal. After my meniscus repair, I did the PT and had it braced for 6 weeks. After my doc cleared me to go back to work, my knee gave out and I hit the floor. I went to the doc later that week and he told me I completely re-tore my lateral meniscus and tore my medial meniscus from the fall. I never had them repaired because my father had just passed away. Anyway, this past June, I slipped in some mud and all my weight landed on my right (bad) knee. I went to the Ortho and he told me that he was pretty sure that I tore every ligament and tendon in my knee. Ortho gave me a rigid ACL brace, but because my leg is so twisted, I could t wear it for more than 3 hours a day!! It also now dislocates and I can feel my femur and tib/fib rolling over each other behind my patella. MRI was done and sports Ortho said everything was fine besides the total dislocation and the absence of cartilage behind my patella. Lately my knees have been hurting a lot more than usual and have crazy increased swelling. I have probably 50 different knee braces/immobilizers and bone of them feel like I am getting enough support. Both of my knees also hyperextend. I don't know which one would be better for me or have the few "options" I like better. I am looking at the "Playmaker II" and the "Bionic" braces. I like the sleeve better than the wrap around. And I like the BACK of the brace to be closed behind my knee. If you are unable to wear the rigid knee brace which is the best brace to support the damaged ligaments and keep the knee stable, then your next option would be the Playmaker II and you will want to get the brace with the patellar doughnut to provide support for your kneecap. Is the don joy play maker 2 a good choice for a football knee brace next season? I only tore the acl this season and had it reconstructed, it's one year from then would this be a reliable knee brace i can trust? What brace do you recomend? I had a partial medial meniscectomy last year on the same knee I ruptured my ACL graft. Not looking to have another ACL reconstruction anytime soon but I am looking for a brace for skiing and martial arts. Would the playmaker II be my best option? I tore the ACL (completely), MCL partial, and meniscus while skiing. The ACL scarred well and the MCL healed, no surgery, and my knee is quite stable. The meniscus was surgically repaired. The surgeon says my knee should be good for skiing as is but if I feel I need a brace, OK. I ski fairly aggressively (maybe not this year). Which brace is recommended if i decide to get one? Obviously, I would like to reduce the chance of another injury and to take some stress off the knee. I am seeing a doctor in the next couple days but Im pretty sure I hyperextended my knee. I am an athlete. I have issues with spraining ligaments too. Is this the right brace for me? The Playmaker will provide protectin to the knee and it's ligaments and would be a good choice brace for the injury you had. I'm 31 yo with moderate osteoarthritis in one knee. I had ACL surgery years ago, but recently my ortho surgeon says my knee is very stable and the swelling, pain, and stiffness is just from the arthritis. I also play semi-pro basketball. I tend to have swelling above the knee and sometimes behind the knee. Which knee brace or sleeve is best? i would like something that provides a nice compression esp. above the knee or at least keeps that swelling from occuring after playing. I had an act reconstruction in 2008 and have not worn a brace but have recently injured my knee skiing and now experience some pain and instability skiing. Would the playmaker be a good solution while skiing and also playing basketball? I had a acl and meniscus surgery 10 months ago. I've been training and getting the knee strong again. I've torn it while playing football. And I'm looking to play college football. I'm a fullback and linebacker. Will this brace provide me the protection, stability and range of motion I need on the field? And can it handle the contact of other players? I am 26 years old, and had 2 ACL reconstruction surgeries in the past 2 years. I want to go back into sports again but am scared to. I need to be extra careful, since I don't ever want to go through with surgery and the long months of physical therapy again. Which brace would you suggest for me? The best prevention of another ACL tear will be to wear either the Custom Defiance Knee Brace or on of our "off the shelf" alternatives. The Defiance is our premier knee for prevention of ACL injuries. the brace has a lifetime warranty on the frame and hinges and our fourcepoint hinge and four points of leverage strapping system have been clinically tested to prevent a re-tear of the ACL. The patient ready alternative to the Defiance is the Full Force Ligament Brace. If you don't want an arthristis brace you have the option of a soft-hinged knee brace for general knee support. Feel free to contact us to speak to a brace expert. I tore my ACL in August and will most likely have reconstruction surgery in 2 months. I was just given the Playmaker II by my Orth. the XL was too small so I exchanged it for the XXL and that is too big. Should I try a different type? Please contact us to speak to a brace expert. You will need to provide your measurements so that we can determine the appropriate size. What is the benefit of having a patella donut? The patellar donut provides support around the kneecap, if you have kneecap pain. Will this brace fit under pants leg? As a nurse I need to wear it and not draw attention to my knee problems. My measurements are: Thigh - 22, Knee - 14 1/2, Calf - 14 1/2. Which size brace would you recommend that I get? Also, if one is better.... sleeve or wraparound for these measurements. Hey, I had High grade partial Acl tear one month before...and I'm using playmaker for 2 weeks.it gives good support but I feel it's not tight enough to withstand at sometimes.Can I continue using it? Hi, I hope I find you well today. So I tore my acl earlier this year in May, I used to play Field Hockey. I intend on getting surgery done in the near future. At present I am coaching and I play against the girls but I would like to have more stability and feel safe. Would you recommend this brace for me to play with? Thank you. What is the difference in support with this brace with the patella donut vs. without??? The patella donut provides support around the kneecap and is used when someone has instability around the kneecap or pain. My calf measures 13 1/2 inches and my thigh measures 19 inches. Do you think the small would be the appropriate size even though the thigh might be a little tight?? These type of braces can run a bit small, I suggest ordering the medium size. I recently had MCL sprain (2 weeks ago) , i play high school soccer and I would like to play soccer againbut When i kick or pass the ball with my inside of my foot i feel pain, so do you thing this knee brace would help me with this pain? Two weeks isn't a very long time for that ligament to heal so it will be sore for a while and when you are kicking with the side of your foot you are putting pressure on that ligament. A brace will help protect the ligament but may not take the pain away. this will take more time. I had ACL reconstruction surgery 9 months ago and I would like to start playing soccer again. I was looking at at the PLAYMAKER II and PLAYMAKER II FOURCEPOINT. I was wondering if one of these is the best option without spending to much money and if so what is the difference between the two. Thank you. If you had ACL reconstruction 9 months ago and want to play soccer, you really should be in a rigid knee brace not a soft knee brace. The rigid brace will offer moderate support where a soft brace such as the Playmaker II will only offer mild protection. The fitst year after the surgery you had is a important time to make sure that new graft is protected. My reccommendation would be the FullForce Ligament brace https://www.betterbraces.com/donjoy-fullfource-ligament-knee-brace If you are still thinking about a soft knee brace then the Playmaker II with the fourcepoint hinge would be the better choice. The hinge will better protect the ACL than the hinge on the regular Playmaker II. My son plays on the offensive and defensive lines for his high school football team. I would like to get him knee braces to help protect against potential ligament injuries. He has not had any injuries to this point. Will the Playmaker II serve this purpose? Thanks! You can read a little bit about the design at the attached link. The playmaker is a great option for a high school athlete. Feel free to contact Product Support with additional questions. 888-405-3251. Between 1993 and 1995, I had 5 right knee surgeries: ACL Replacement, LCL tear repaired, medial meniscus shaved and smoothed, underside of kneecap ground down and smoothed, 4 plicas had to be removed as well as bone spurs. Military issued me the original Donjoy playmaker to be worn under my uniform and the Donjoy rigid sport brace to be worn over my work uniform. Now I have arthritis issues and will under go scope for scar tissue removal. Is the Donjoy playermaker II still a good brace for me and what hinge: D III. or Forcepoint? The Playmaker II knee brace does not adjust like that. Are you sure you have this brace of could it be something else. Had ACL reconstructive surgery in 1994. Now have arthritis issues. Have old 1994 Playmaker. Will Playmaker II help with arthritis issues as well as protect ACL? Hi, I have a torn meniscus in my right knee and a osteochondroma on the bottom of the same knee. The doctor recommended surgery to remove them both and will be done in December. So until then I am looking for a good knee brace. I have been looking at the Playmaker II but need help with the size. My measurements are 16 Knee, 20 1/2 Thigh and 15 1/4 Calf. What size do you recommend and would the Playmaker II be sufficient enough for before and after surgery ? I tore my meniscus 5 years ago during High School, I am now 80% Mencius deficient in my left knee where they could not repair the tear however I completed my HS career and am now playing collegiately. After the injury I was issued a large hinged slide on knee brace similar looking to the playmaker II. However after years of wear and tear it's time for a new brace for the upcoming season, is the playmaker II my best bet? I ruptured my patellar tendon and had surgery to repair it 6 months ago. I was just cleared to go back to work in the oilfield which is a very physical job. I was wondering if the playmaker II would be the right brace for support, or if there is a different brace that you would recommend? I just received MRI results stating that I have a moderate partial tear to the mid region of my PCL. All other ligaments are ok. The injury was about 7 weeks ago. I play shortstop and I've been about 85% during practice with minimal pain and little to no instability. I have no problem with lateral movements. My biggest issue not being able to sprint. I can jog and run about 75%. I have a military national softball tournament next week and I was wondering if the playmaker II would be a good fit for me during the tournament. What is the HCPCS code for this knee brace? I play basketball and would like knee support while still maintaining performance. I recently had a mild knee hyperextension injury that did not require surgery. Which DonJoy Playmaker II options should I be considering? These are my preferred requirements in order from most important to least important. Stability/support/correct fit, performance (light weight), comfort (coolness). The Playmaker II with the spacer material should give you adequate protection for your knee. Hi, what is the length of the donjoy playmaker II? I tore my ACL and will need to wait 6 months until surgery. Can you recommend a brace that's at an affordable price that can help prevent any further damage to my ACL? I was reading the earlier questions and you guys mentioned the Forcepoint hinge but my budget is from $100-200. Thank you! Both of my knees and hyperextended, I've had it for over 10 years. I don't know if from an injury or birth but they both go back pretty far. I am unable to stang with legs straight and have to constantly stand with them bent back. I am starting physical therapy within the next few weeks and was wondering what brace would be best to help with the hyperextension. I had ACL surgery two years ago from a skiing injury. I am getting back on the slopes and looking for a brace to wear. I have always been a cautious skier and stick mainly to blue and green trails. What brace would you recommend? I am between the Playmaker II and Playmaker II Fource Point. If you are going to go with a soft hinged brace then i would reccommend the Playmaker II with the fourcepoint hinge. The foucepoint technology is our best hinge for protecting against re-tear of the ACL. I recently experienced a moderate strain to my right knee MCL while playing golf. I also play hockey and want a brace that will fit under my shinguards. Both of the Playmaker models seem suitable for my needs but can you please tell me which has a more low profile, thinner design...the Playmaker II or the original Playmaker? The Playmaker II has a lower profile hinge and the spacer material is a little thinner than neoprene. That would be my suggestion. I recently tore my meniscus in basketball and I would like to purchase a brace to protect me when I play quarterback in high school football. I want to know what brace would be best for me as my play style is a dual threat (running and passing) quarterback that would protect against hits and prevent me from having to get my knee scoped again. I also want to know what would be the most comfortable to be playing a full game and taking hits. The Playmaker II would be a great brace for you to use while playing football. The brace will offer both medial and lateral protection with the hinges and the material is light wight and flexible to allow you to move freely. The spacer material is cooler than neoprene and the hinges are low profile. this is a great brace for you. Four weeks ago I fell on a run and have likely torn my ACL to some degree. I may also have some PCL damage (my MRI results are pending). My PT has recommended either the Don Joy Playmaker 2 or the Full Force brace for my injury type and activity level. Prior to the injury I ran 60 kilometers a week and trained for trail ultra marathons. Which brace would A. be the most comfortable being worn all day and B. stay put when I'm out on a run, even after 5-10 miles? Thanks very much! You should wait until you know exactly which ligaments have been injured. If you have torn both the ACL and PCL you do not want to wear the Full Force Ligament knee brace because that fouce point hinge is contra-indicated with a PCL injury. The hinge will create posterior force on the tibia which is what you do not want to do with a PCL injury. If you have not completly ruptured either of the ligaments, then the Playmaker II would be a sufficient brace for your knee while it is healing and during your activity. If you have completely torn either of those ligaments I would suggest a rigid knee brace such as the Armor with a Standard Hinge. https://www.betterbraces.com/donjoy-armor-knee-brace-with-standard-hinge If you have only toen the ACL then the Full Force would be the best brace for you. I'm looking at the playmaker II but can my measurements are between a large and x-large what brace should I pick? Thigh 23 1/4" knee 17 1/2" calf 17 1/2"
Would this be a good brace for a wrestler? This brace would great for anyone play in any type of sports. What matters is what you need the brace for. the brace gives moderate support for all of the ligaments of the knee. The Playmaker II should work fine for the issues that you had on your knee. The sleeve works best for sports related activities and the spacer material will not be as hot as neoprene. The size changing should not be an issue as you are not going to change that dramatically. does this brace slip or slow you down when you run and it it good for contact sports such as football? The brace should not slip other than normal migration with a sleeve after sweating, but it is the correct size it should be fine. It will not slow you down and you can wear it while playing football. I have the playmaker II brace i need to get my leg straight. Is there any way that the hinge locks so my knee can not bend? That brace does not lock. I am a 55 year old woman who had surgery 40 years ago for a recurring patella dislocation. Ligaments were more tightly secured with a "pin" under the knee cap. Four years ago I also had 80% of my lateral meniscus removed in that same knee. X-rays show my knee continues to deteriorate due to the trauma its been through, and the resulting arthritis. My knee is showing more instability and tends to swell after exercise. I'm trying to postpone getting a knee replacement, while continuing my active life -- playing doubles tennis, mostly, and walking a fair amount. Which type of brace would you recommend for someone like me, particularly while I'm playing tennis? Also, what material? Wrap or sleeve? Donut or not? Secondly, what would you use to ice the area after playing tennis? After ACL I had brace now am using playmaker wrap can this be worn over jeans? I tore my meniscus and was wondering if this brace would be good to wear for football to prevent further injury to my knee. I don't have and ACL in my knee i tore my meniscus so i am looking for a brace to use to stabilize my knee. what would you recommend for a brace for severe hyper extension instability due to stroke with a center knee measurement of 18" , calf 14.5" and thigh 20"? I am 50, about 25 lbs overweight and I have a torn ACL for an injury when I was 15 years old. My doctors do not recommend surgery. My knee mainly hurts on long drives (hour or more), and I am probably starting to get arthritis. I am looking at the DonJoy Playmaker II, but I can't figure out the size. My calf and knee fall in the Medium range, but my thigh is 18" and falls in the XL range.... do I get the XL? Is the Playmaker II to best choice? I torn my ACL playing football and i have yet to get surgery but have been cleared to play and i just got a college scholarship and am about to start my hell week in college in about 20 days so i need to know if this knee brace will work for me. If you are playing college football on a scholarship and have a torn ACL you should be wearing one of our rigid knee braces. The Playmaker is not going to give you enough support for activity that you will be doing with an ACL deficient knee. My suggesttion to you is the DonJoy Defiance ACL brace with a fourcepoint hinge, and get our football options. I am looking for a brace to provide general stability for a leg that is weak. The weight of the brace is important as the muscles in the weak leg fatigue easily. Can you provide information regarding the weight of this brace? Or do you have other suggestions for a brace that is lightweight but that will provide stability? I am hoping to be able to flex at the knee 30 degrees or so, but need the brace to be stable enough to stop occasional buckling. (I understanding that buckling would still occur up to the angle at which the brace is set). Thank you! The Playmaker II knee brace wieghs around 2 lbs and comes with a stop kit but the lowest flexion stop is 45 degrees. I had a ACL surgery 9 months ago and I've been recovering well, but I still feel my knee a little bit weird during pivot shifts and it clicks when I flex after being hyperextended. I used to play team handball (contact sport) and I want to know which brace will be better for me. I had ACL surgery a year ago. I am still working on rehabilitation to get back to quick lateral movements, sudden stop and go movements, and jumping/landing at full speeds for both basketball and snowboarding. I am a very aggressive athlete and I researched on google and found that this ACL knee brace was highly rated. 1) I was wondering for the two sports that I will be planning to do regularly, which specific options would be best for me on this knee brace? I'm assuming the drytex would be the ideal material. I am wondering if the sleeve would be a good choice...I have worn knee sleeves before that I bought at Walmart, I'm not sure if theyre too small but after 30 minutes to an hour of play it feels like it is cutting blood circulation off and also irritating my skin. 2) Also what is the difference between the playmaker and this playmaker 2? For someone who had a recent ACL reconstruction I would not suggest this brace for basketball and snow boarding. I would suggest one of our rigid knee braces. Either the DonJoy Armor Knee Brace with the Foucepoint hinge, https://www.betterbraces.com/donjoy-armor-knee-brace-with-fourcepoint-hinge or the DonJoy Defiance Knee Brace https://www.betterbraces.com/donjoy-defiance-iii-custom-knee-brace Both of these braces have our Fourcepoint hinge and four points of leverage that have been clinically proven to help reduce ACL re-tear up to 50%. The Armor is a "off the Shelf" brace that has a 1 year warranty on the frame and hinges, the Defiance is custom made for you knee and has a lifetime warranty on the frame and hinges. These braces are more suitable for someone as yourself who is just getting done with rehab and wants to compete in demanding activities. My name is Fred and lives in Mauritius, Indian Ocean. My son has a partial acl tear in his right knee and has not undergone surgery. He is on rest since end March ths year. 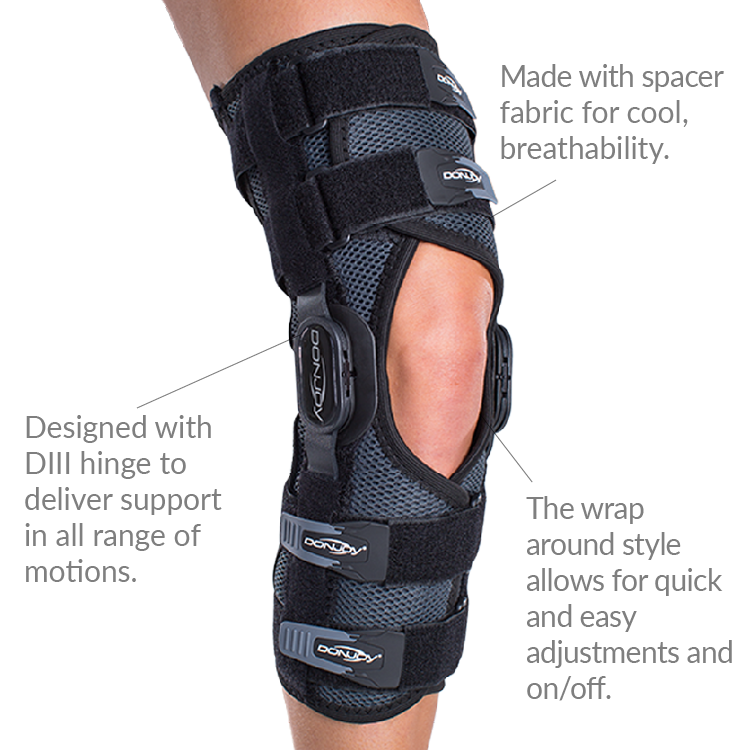 I have read about DonJoy Playmaker II knee brace. Is it the right one to be choosen to help him to restart playing football ? Is it adviseable to play with it or for jogging only? I had my knee buckle during soccer a few days ago, and strained the LCL (but no damage to any other knee ligaments). I'm looking for a brace to provide some stability for walking and hiking for the next couple months. Would this brace be a good option? Hi, I had a ACL Surgery 8 months ago the doctor says that I recover my stability and fell good about it. ,I practice kitesurfing in salty water, does the hinge gets rusty?. I still have some pain in my knee since I need more strength on my quadriceps. do you recomend this Playmaker II knee brace or I should go for the web knee brace? I ruptured my acl in both knees (left 10 yo, right 5yo). I did significant additional damage to meniscus, MCL and LCL with each injury. I am currently hiking the AT and have over 400 miles. I am experiencing significant and debilitating pain on steep downhills. The patella is involved but also experiencing pain and swelling above the knee cap on the lateral/outsides of the knees. Left knees more so than right knee. Which brace do you recommend? Material breathability is important as well as stability in positioning of brace. I am looking for comfort, non abrasive brace for long distance backpacking. Thank you for your question. The play maker II is a very breathable material. The Playmaker II with FourcePoint hinge may be a good option as it will gave additional support and protection to the ACL. The Playmaker II will give support to the LCL/MCL with the metal hinges and the strapping also will help with joint support. If you have additional questions please don't hesitate to call. I ruptured my posterior cruciate ligament a couple of years ago and have a good deal of knee instability. I am looking for a knee brace that will stabilize my patella as well as the remainder of my knee. I need it for activities of daily living and working out at the gym for achieving fitness, I am not an extreme athlete! Which version of the Playmaker II will give me the best patella support? The sleeve or the wrap around? Is this the right brace for me? We just ordered the Playmaker II Spacer Wrap knee brace for my daughter. It is sliding down on her when she plays. Is the sleeve style Playmaker any better for staying put? It feels pretty snug to do up, so I don't know if the next size down would work. Or is there something we can put with it to keep it from sliding down? Thank you! What is the best material when the brace is used in the summer time? I see 2 options, Neoprene and spacer. i have this brace. it is a great brace. I am currently using it on my left knee while awaiting an MRI on that knee for a possible ACL tear.. I have used it on my right knee after 2 procedures on that knee which has left it unstable when lifting heavier weights. The brace provides a high degree of support for my knees. Without it on and only using crutches to move around my left knee will shift laterally in a bad way. The spacer material is the proper way to go for material. It breathes well and is more compliant than neoprene. I do highly recommend getting the sleeve to go under it. Extended wear time was irritating to the skin on my leg. The only down side and it is not even a big thing is the size of it. It is HUGE. Without actually measuring it, I would estimate 18" long. It takes getting used to but after a few times wearing it I was used to it. For something short of a custom built brace this is the best thing I have used and I have had a brace of some type on my knee for 15 years and counting. You really get what you paid for on this one. I don't normally write reviews, but I have to let you know that this company is TOP NOTCH on customer service. I had questions regarding the brace we were considering and when I called the phone number I was immediately connected with an agent who understood my questions and got me onto the right expert. Once I talked to the "expert" I was advised of various ways I could get the right brace, including a local rep for the DonJoy brand. I have NEVER had a better experience with service, results, and value. I would highly recommend this brace for the quality, and the Better Braces.com for service, and DonJoy for employing high quality representatives of their products. Great brace to start doing the re-athletisation process following MCL / PCL tear, meniscus tear, ACL hyperextension, patella subluxation and small fracture of tibial plateau. Pros: The knee really supported. I have owned several braces that were specially made for me. I have never had a brace in this price range that works and is as comfortable as this brace. This brace stays in place and gives very good support. Great customer service helped through all my questions I had a tibia plateau fracture required surgery it was pretty bad break this is a life saver its so breathable, lightweight, not bulky compared to the generic one the hospital gave me the playmaker 2 is the best there is highly recommend. Great brace allowed me to continue hiking in the mountains! I live in the high country up in the mountains of Colorado and like to hike. I started having really bad pain whenever I was hiking downhill. At first I tried some less expensive braces with no help. I decided after talking with customer service to give this brace a try and it worked. I am now able to hike up and down steep inclines with no trouble. Also, the brace has caused me no discomfort having used on many hikes 6-8 miles each. next year I plan on conquering some 14ners with the help of this brace! Gave me the stability I needed! Had an MCL tear and was not able to go bowling anymore because of weak stability. this brace gives amazing support and I can now go bowling with no pain whatsoever. I strained my knee playing hockey and was out for 6 weeks, this brace helps me play now with no pain and gives me a secure feeling about playing again. I have this in both the Medium Sleeve, and the Large Wrap. My measurements put me right on the line for sizes, so it was hard to know which to select, based on the different design. I love this brace. It does exactly what I need it to for a torn ACL and pre-op support. Cons: The sleeve version is very supportive, but with the knee donut it's very hard to have any mobility. The wrap version is the opposite. Much better mobility but not much support in the kneecap. So it depends on what you need from it. Well I haven't re-torn my ACL yet.